Mary Davis tells an Inclusion Ireland debate that she would appoint a person with intellectual disabilities to the Council of State. MARY DAVIS has pledged to appoint a person with intellectual disabilities to the Council of State – the first time in history that such a person would have sat on the Council. Speaking at a presidential debate organised by Inclusion Ireland, the national association for people with intellectual disabilities, Davis said nominating a person with intellectual disabilities would be a sign to other disabled persons that they were being recognised. 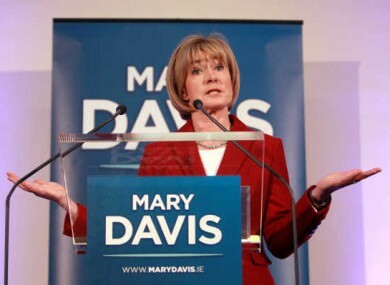 “I find it shocking that one of the first consequences of the recession was the effective shelving of the Disability Act and the Education for Persons with Special Educational Needs Act,” Davis told the debate at the Mansion House in Dublin. She added that it was “grossly unfair” for disabled persons had to lose basic rights, and endure cuts to “an already very modest disability allowance”, when the economy had turned. The Council of State is a special body which can be convened by the President to advise them on the use of their discretionary powers, such as the referral of laws to the Supreme Court. Also speaking at the debate, Seán Gallagher said Ireland needed to focus on what it could do to help those with intellectual disabilities, and not those things which it could not do. He added that a “mature society” valued its most vulnerable members, and called for a greater awareness that people with disability had certain entitlements. Michael D Higgins lamented Ireland’s delay in ratifying the UN Convention on the Rights of Persons with Disabilities, and said the forthcoming Mental Capacity Bill would help to bring about a culture of “assisted citizenship”. Gay Mitchell commented that he wished to be seen as an inclusive President, remarking that inclusiveness was an absolute quality, and said he would use the Gaisce award to encourage involvement in disability outreach programmes. Martin McGuinness commented that not enough had been done during the Celtic Tiger era to help those with disabilities, and that whatever gains had been made were now under threat. He said people with disabilities had “taken their rightful place as first-class citizens”. David Norris said he hoped to use the presidency to act as a voice for the marginalised, and commented that while people with disabilities were equal to others, they were excluded “because Ireland isn’t included”. Dana Rosemary Scallon did not attend this morning’s event, which was moderated by Miriam O’Callaghan. Caption competition There are HOW many days to the election? Email “Davis promises to appoint intellectually disabled person to Council of State”. Feedback on “Davis promises to appoint intellectually disabled person to Council of State”.